You know Venice, but do you know the Veneto? The Veneto is a region in the northeast corner of Italy and not surprisingly the region includes the city of Venice, plus a number of other wonderful cities and places to explore. Verona! Padua! Vicenza! Treviso! Lake Garda! 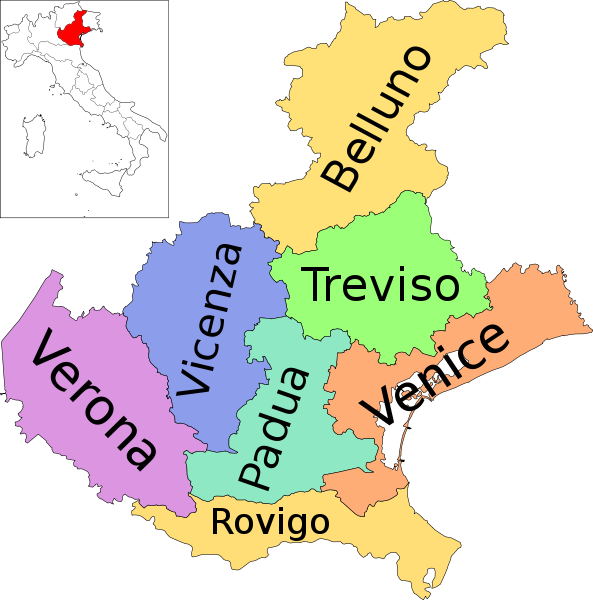 Map of the Veneto region. The terrain is varied, surrounded by the Dolomites mountain range to the north, the Venetian Lagoon, which lies between the Italian mainland and the Adriatic Sea to the east, and fertile plains extending to the Gulf of Venice to the south, and the wine region of Valpolicella and Lake Garda to the west. We are so excited about this region that we’re taking a culinary tour group to the Veneto from April 28 to May 5, learning (and tasting) the foods and wines of the region with Chefs Michael Lombardi and Kevin O’Donnell of SRV Restaurant in Boston. Risotto. You can’t go to the Veneto without sampling its world-renowned risotto, made from a variety of rice known as Vialone Nano. Risotto is a speciﬁc way of cooking rice in which it is ﬁrst toasted in olive oil or butter until the kernels start to puﬀ up, and then broth is added very slowly while continuously whisking, until perfectly thick and creamy. Depending on the region and season, you might ﬁnd risotto with vegetables such as asparagus, artichokes, peas, pumpkin, and even radicchio. Near the coast, risotto might be prepared with scallops, scampi, and squid or cuttleﬁsh in its ink, called risotto al nero di sepia. Seafood. Fish and seafood – cod, sardines, anchovies, eel, squid, octopus, mussels, clams, and prawns – make up a large portion of the local diet, especially around Venice. Along the Adriatic coast, ﬁsh soups (brodetti) are traditionally served as ﬁrst courses. Sarde en saor, sardines marinated with vinegar, onions, raisins, and pinenuts and bisato (stewed eel) are common seafood dishes. Polenta. Made from ground cornmeal, polenta has been a staple of the Veneto since Roman times. Once cooked, polenta can be served as is, that is, soft and porridge-like, or it can be poured onto a slab and allowed to cool – forming a solid cake. Polenta is extremely versatile and can be served with nearly anything from braised meats such as cinghiale (wild boar), osso bucco, pigeon, or pastissada (horsemeat stew), to baccalà alla vincentina, codﬁsh simmered in milk and ﬂavored with a savory soﬀrito of garlic, onions, and anchovies. In solid form, polenta can be layered with cheese and tomato sauce to form a lasagna of sorts or grilled and layered with, for instance, tomatoes, fresh herbs, and mushrooms, bruschetta-style. Pasta. While rice and polenta reign supreme in the Veneto, pasta still has a presence. Bigoli is a long pasta, similar to spaghetti but thicker, originally made with buckwheat ﬂour. Nowadays, it’s made with whole wheat or 00 ﬂour, egg, water or milk, butter, and salt. It’s common to ﬁnd bigoli served with a duck ragu or a simple combination of slow-cooked onions and salted ﬁsh, usually anchovies or sardines. Gnocchi is another common pasta dish in the Veneto. Wine. Veneto is a traditional wine growing region, with more than 60% of its cultivated varieties native or Italian grapes. Some of Italy’s best loved wines come from the Veneto: Amarone, Valpolicella, Soave and Proseco. Grapes drying to make Amarone wine. Meat/Game. While meat features less frequently in the Veneto, cured meats, and wild game (e.g., duck, rabbit, quail) are traditional. Desserts. Typical desserts of the Veneto include zaletti (cookies made from polenta), frittelle (fried doughnuts), galani or crostoli (crisp pastries spiked with grappa), and pandoro or “golden bread” given the many egg yolks used to make it. The latter is traditionally made during Christmas and New Year. We hope you’ve enjoyed learning about the delicious foods of the Veneto, whether you are traveling via armchair or whether you decide to pack your bags and join us in the Veneto in late April!